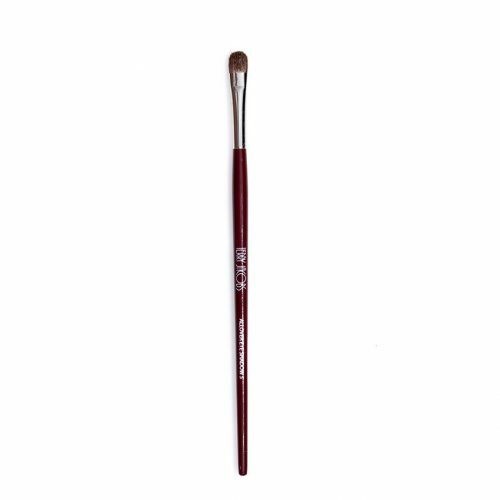 A complete line of Professional Make-Up Brushes made by seasoned craftsmen with love. Every hair and every bristle of each brush is shampooed, vibrated, and combed and shaped like the golden strands of a movie star. Out handles are special. We shape them from selected New England Birch to achieve the best balance in your hand. The pores are sealed to prevent cracking and triple-lacquered for long life. The job is done with human hands and eyes, paying close attention to every detail. And lastly, the brushes travel through a team of craftsmen, that will inspect or reject each brush as it goes down the line, and lastly, our official brush inspector examines each one with a 10X magnifier, to be sure it is made to perfection for you.